On SiteBuilder Editor hover on more menu on the navigation bar. When you hover on more menu two buttons will be drop down i.e Reset Page and SEO Options. On clicking SEO Options you will see a dialog box will appear. In the dialog box add all the meta details for the page. 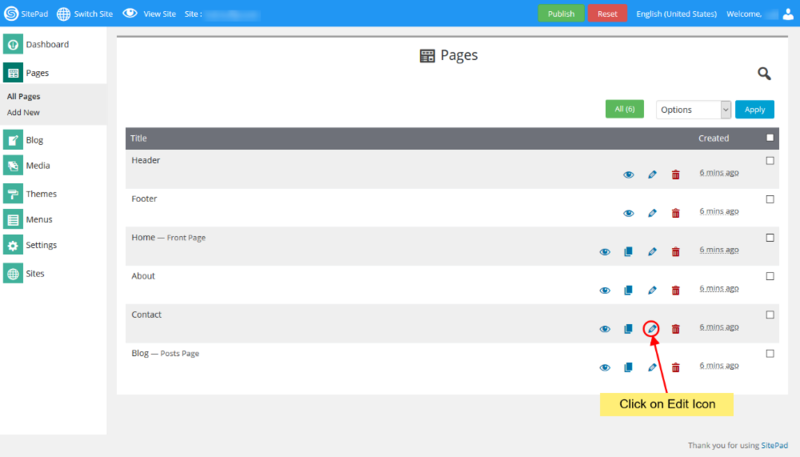 You can add Meta Tags for every page just by selecting Page from the drop down. After adding meta details click on Save Meta to update the meta details for the page. Note: If Meta Data is not found for a particular Page, the Global Meta Data will be used. To Clear Meta Details of the current page click on Clear Meta. All the Meta Details for that page will be cleared. For Global Meta you will need to select Global Meta and then click Clear Meta.